Craft warming winter cocktails at home with this set of four small-batch spice extracts. Mmmm, the combination of sweet and savory that gives cardamom its complexity. And that earthy, aromatic goodness of sage. Nice and warming, they're commonly used in winter dishes. Here's a pleasant surprise: They're also delicious in cocktails. Amy Nazer uses a cold extraction process to turn these spices, as well as star anise and clove, into tasty cocktail ingredients. 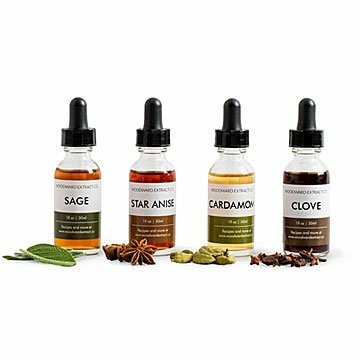 The set of four flavors, each in a tincture bottle with an eye-dropper, lets everyone from budding mixologists to serious cocktail connoisseurs craft unique drinks at home. Use them to give your favorite spirits a fresh spin, or create a more complex concoction with one of the included recipe cards. (Amy worked with local distillers in Brooklyn, where she makes her extracts in small batches, to develop the recipes.) The icing on the cake? When you're not up for imbibing an alcoholic beverage, they can also be used in baking. Amy Nazer first moved to New York City to study politics and human rights. She’s held several jobs at non-profits and legal organizations, but it was her side hustle that prepared her for her current career: expert extract crafter. Even as Amy worked her day jobs, she honed her baking and cocktail making skills in her spare time. She tackled ever more complex projects, from made-to-order holiday cookies for coworkers to wedding cakes and custom cocktail syrups for friends, but she could never find exactly the right ingredients. Unwilling to settle for mediocre flavorings, she decided to make her own. The only child of a chemist father and a dietitian mother, Amy knew a few things about food and experimentation. Her passion for creating unique flavors turned into a business, and now she develops and produces high-quality extracts in small batches from her commercial kitchen in South Williamsburg, Brooklyn. I bought this for a friend who owns a bar and loves concocting exciting new cocktails. I love the idea of these flavors in drinks!